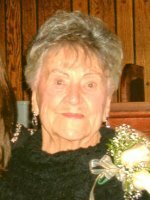 ALBANY – Mary A. Johnas, 96, of Albany, died Friday, November 9, 2012 at Our Lady of Mercy Life Center in Guilderland. Mrs. Johnas was born in Troy, the daughter of Louis and Helena Morrissey Stratta. She lived in Watervliet for a time, but lived most of her life in Albany, where she was a communicant of St. Vincent DePaul Church. Mary’s life was centered around faith and family. She was happiest when she was with her children, grandchildren, and great grandchildren. Her love and selflessness will be remembered by all. Everyone who was a part of Mary’s well-known “prayer list” can be assured that they will continue to have a heavenly advocate. Mrs. Johnas was predeceased by her husband Henry A. Johnas in 1961. She is surived by her children Sr. Jacqueline Johnas, CSJ, of Ilion, NY, Carole A. Sabatino of Slingerlands, Susan E. Horan (Bill) of Guilderland, and Michael L. Johnas (Flerida Santana) of Stamford, NY; her sister Helen Cole (Martin) of Latham; her grandchildren Michael Sabatino (Luciana), Matthew Sabatino (Brenda), Scott Sabatino, Kelly DelMonaco (Pat), Caitlin Horan, Colleen Cole (Danny), and Christopher, Stephen, Nicholas and Luke Johnas; her great grandchildren Julia and Pasquale DelMonaco, Gianna Sabatino, Zachary and Shane McHarg, and Dominick Parker; and by many nieces and nephews. She was predeceased by her sisters Anna Mae Wilson, Geraldine Biskup, and Frances Assini, and by her brother Jack Stratta. The family extends their deep appreciation to the staff of Our Lady of Mercy Life Center and the center’s Fatima Unit for the wonderful care they provided to Mrs. Johnas. Funeral services will be held in the Hans Funeral Home, 1088 Western Ave., Albany, Tuesday morning at 9:00, and from there to St. Vincent DePaul Church, Madison Ave. & Partridge St., Albany at 10:00. Relatives and friends are invited, and may call at the funeral home Monday from 4-8 p.m. Interment will be in St. Agnes Cemetery, Menands. The family suggests memorial contributions to Our Lady of Mercy Life Center, 2 Mercycare Lane, Guilderland, NY 12084. To leave a message of condolence for the family, send a sympathy card, or obtain directions to the funeral home, please visit www.HansFuneralHome.com. Click here to view Mrs. Johnas’ resting place in St. Agnes Cemetery, Menands, New York. To the entire Jackie Johnas family. Jim and I want to express the saddness of the passing of Mary. She was like family to us and the memories of her coming to visit us here in Maryland will always be in our hearts. We had so much fun the week she spent with us. I still can see her sittng on Sharks Tooth Island enjoying the sunshine and more so the ride back home with the wind in her hair. I will post some photos of that trip later today. for now to someone we love.